Southeast Michigan residents have a unique opportunity to provide valuable guidance to elected leadership in Lansing and help shape how we will maintain and improve the transportation system – roads, bridges, and transit – in Southeast Michigan through a regional online survey sponsored by the Metropolitan Affairs Coalition (MAC) and SEMCOG, the Southeast Michigan Council of Governments. I urge citizens to take the online survey directly, or by visiting http://www.semcog.org/or http://www.semcog.org/MAC.aspx. federal, state and local sources (primarily gas taxes and vehicle registration fees). There are many causes for this large gap, including the general economic downturn, fewer vehicle miles traveled, more fuel-efficient vehicles, and the fact that the gas tax has not been increased since 1997. In addition, we are the only large metropolitan area in the country without a coordinated transit system that serves the needs of the region. To ensure that Michigan preserves a high quality of life and attracts and retains business investment, tourism, and a dynamic and educated work force, we need to maintain our roads and bridges in good condition, and provide better transit options. 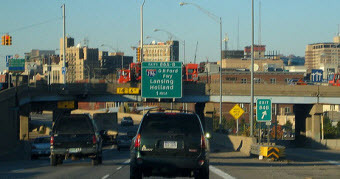 The importance of investing in maintaining and improvingMichigan’s roads and bridges; and the importance of expanding public transit in Southeast Michigan. This Pulse of the Region survey is an easy way for the public to voice their opinions and have an impact on the future of the region’s transportation system. With legislation just introduced in the Michigan House and Senate on these critical issues, now is a perfect time to speak up and let your elected officials know what you think.